Convenience food store chain 7-Eleven has joined Aloha Island Mart and KTA Superstores in providing healthier alternatives that satisfy customers’ snack and drink cravings. Open the attached newsletter pdf to read more. Kathleen Merriam’s world came to a screeching halt when hearing that Michael, the youngest of four siblings in her family, took his own life. Although it happened well over a decade ago, she still vividly remembers the phone call on Sept. 13, 2005 at 4:16 p.m. telling her that Michael was gone. Open the attached newsletter pdf to read more. Gavid Uchida, DDS, MBA has been named the department’s new dental director. 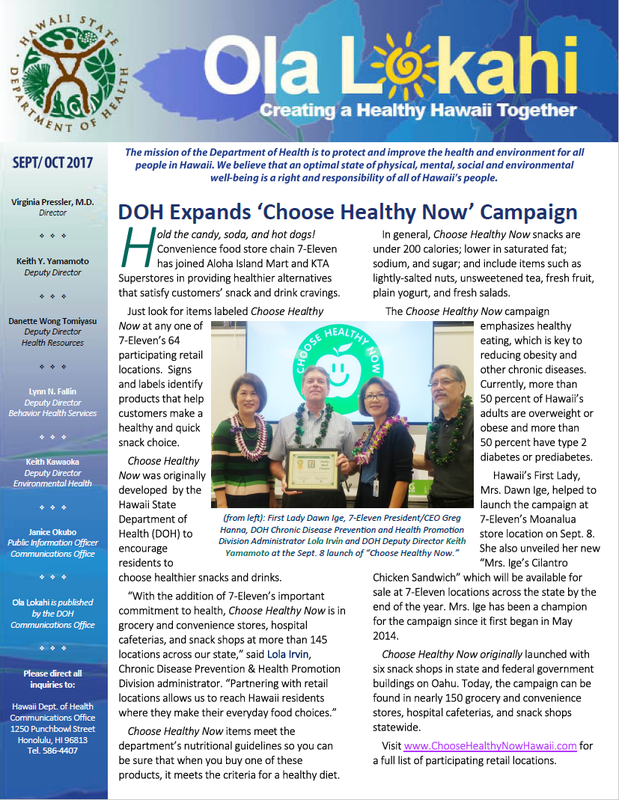 His responsibilites include improving the oral health of Hawaii residents by implementing strategic initiatives that promote oral hygiene through the prevention as well as treatment of oral disease. Open the attached newsletter pdf to read more.